The Poseidonia Beach is a 4 star hotel set in the tourist area of Limassol.The 7-story hotel building is surrounded by 2000 sq.m. of gardens and features 138 well appointed guest rooms. 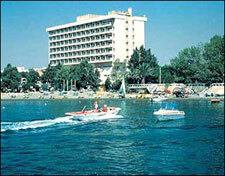 The hotel is situated 5 km from the shopping centre, 8 km from Limassol center and 65 km from the airport. The hotel offers a 153 sq m. swimming pool and children's pool. There is a tennis court, minigolf, a gym and sauna, Jacuzzi and a children's playground. Enjoy a continental breakfast or a varied buffet breakfast with whole meal products. For lunch there are cold and warm dishes buffet and a variety of deserts. Have a buffet style dinner and dishes cooked on the spot. All three meals are served at the hotel's restaurant.